Austrian poet, novelist, and satirist; born in Horitz, Bohemia, Nov. 22, 1849. He attended the Piarist gymnasium in Prague and then ostensibly studied law at the university, though in reality he busied himself almost exclusively with philosophy and the history of art. He passed only the first state examination in jurisprudence, after which he was occupied for a short time in a lawyer's office in Prague. While there he published a collection of sonnets, under the title "Die Grosse Revolution" (1871), which almost brought upon him an indictment for treason. This was followed by "Anna" and several minor comedies, which were successfully produced. He then devoted himself exclusively to literature. 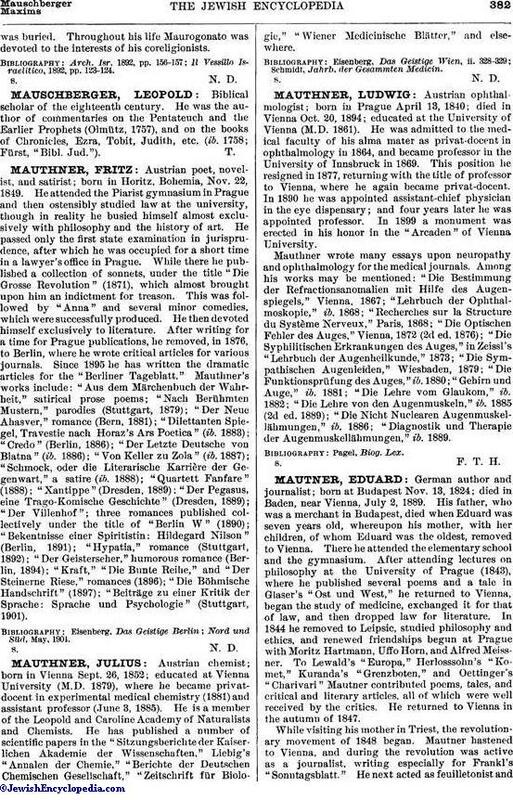 After writing for a time for Prague publications, he removed, in 1876, to Berlin, where he wrote critical articles for various journals. Since 1895 he has written the dramatic articles for the "Berliner Tageblatt." Mauthner's works include: "Aus dem Märchenbuch der Wahrheit," satirical prose poems; "Nach Berühmten Mustern," parodies (Stuttgart, 1879); "Der Neue Ahasver," romance (Bern, 1881); "Dilettanten Spiegel, Travestie nach Horaz's Ars Poetica" (ib. 1883); "Credo" (Berlin, 1886); "Der Letzte Deutsche von Blatna" (ib. 1886); "Von Keller zu Zola" (ib. 1887); "Schmock, oder die Literarische Karrière der Gegenwart," a satire (ib. 1888); "Quartett Fanfare" (1888); "Xantippe" (Dresden, 1889); "Der Pegasus, eine Trago-Komische Geschichte" (Dresden, 1889); "Der Villenhof"; three romances published collectively under the title of "Berlin W" (1890); "Bekentnisse einer Spiritistin: Hildegard Nilson" (Berlin, 1891); "Hypatia," romance (Stuttgart, 1892); "Der Geisterscher," humorous romance (Berlin, 1894); "Kraft," "Die Bunte Reihe," and "Der Steinerne Riese," romances (1896); "Die Böhmische Handschrift" (1897); "Beiträge zu einer Kritik der Sprache: Sprache und Psychologie" (Stuttgart, 1901). Nord und Süd, May, 1904.